This is an important question…but, before I attempt to answer it, I should explain that I CAN’T answer this question for you. I can only answer it as it applies to me. 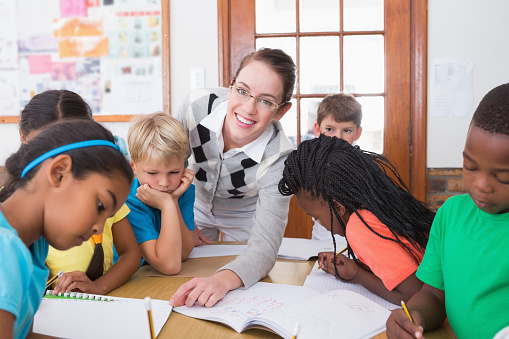 As a former classroom teacher, it was a question I grappled with the first day I walked into my cooperating teacher’s classroom during my semester as a student teacher. It was easy to see that I wasn’t the one in control. It was Mrs. Hall’s classroom. She was my incredible mentor teacher during my student teacher days, and since it was her classroom of third graders, she was in control. Not me. But, I did what I was told to do, going through the various aspects of learning how to teach children. I did well…but, I was never truly the teacher—just the helper, as far as the kids were concerned. I awaited the time during my training when Mrs. Hall would leave me alone for a few hours on occasion while I tried to figure out how to solo. Man! I’d be lying if I said that I felt like I was in control even then. I wasn’t, and it was painfully obvious by the way the third graders reacted to my approach. They weren’t listening to me. I was trying all the strategies I was taught to use that, in theory, were supposed to work with kids. I reverted to yelling, as that was how control was gained in my growing-up years. Out it came. I found myself raising my voice to be heard above the din of noise my out-of-control students were making on a daily basis. Funny, the more out-of-control they became, the more control they had…over me. If you were to ask me today what the definition of control is, I would tell you that it is an imaginary, self-centered perspective that we create in order to mask our fear. That’s what I was doing in my early days as a teacher. Thankfully, with the help of Mrs. Hall, Jim Fay, Foster Cline, and Betsy Geddes, I was able to reset my dysfunctional default and change the direction of my approach to dealing with kids. Let’s face it, if a teacher has classroom management problems, he or she is not truly able to get to the craft of teaching. Almost anyone can learn how to disseminate knowledge, but without exemplary management skills, it doesn’t matter how sharp you are with content, very few of your students will ever get to benefit from your expertise if you don’t know who’s in charge. Let me tell you folks, knowing the answer to this revised question is what saved my career. Here’s the answer…I can only control myself, and that is ONLY on a good day! The point is, I learned that I cannot actually control ANYONE who lives outside my skin. So, if it’s true that I cannot actually control anything, then what? How would I ever get anything done in my classroom? Simple. I quit thinking that I should have the control to make kids listen, to make kids behave, to make them learn. I adopted a new philosophy. I would only try to control how I would react to situations that arose in the classroom. It was very freeing to learn that not only was I NOT in control over my kids, but also that I didn’t need to be. What I needed control over was how to handle myself and my attitude when things didn’t go the way I thought they should go. Cline, Fay, and Geddes somehow sprinkled magic fairy dust on me and I really began to fly as a classroom manager. I learned how to SHARE control with my students over matters that I was willing to let go of. For instance, I had to figure out what was really my problem as a teacher and what were really my students’ problems. I quit taking ownership over my kids’ problems. I figured out that there were only a few big issues to deal with in most of the behavioral issues my kids’ displayed. In order to get buy-in with my students, I quit imposing my rules upon them. Instead, we had a nice long conversation about the kind of classroom THEY wanted to learn in. It was amazing! My students explained that they wanted to feel safe, they didn’t want to fight or be called names, and they wanted to be treated fairly. Some offered that they needed times to be able to talk and also times for quiet. Hmmmmm. Well, those became our rules for a happy classroom, and they applied to me as the teacher, as well. Soon, when disagreements arose in the classroom, when noise became too loud for me to handle, or when I felt like they were making it impossible for me to teach, I was able to call a meeting of the minds and discuss how we needed to realign ourselves with what we all had agreed would be our classroom rules. I told them that I can only be the best teacher they have ever had if they let me teach. So, if I begin to feel that they are preventing me from being the best teacher they have ever had, I cannot allow whatever is happening to continue. This new approach was startlingly successful. It was as if a cloak of darkness had been yanked off of all of us. I remember saying to my students when they were getting noisy that I was more than happy to let them make all the noise they wanted during recess time. That is their turn to make noise. When it is classroom time, that is my time to make noise, and since I would rather teach than make noise, I should be allowed to use my share of my time the way I want, just like they get to do. It made sense to them. It made sense to me. So, when I said, “Whose turn is it to make noise?” they all agreed that it was my time when we are in the classroom. I didn’t have to say anything more about noise except, “Is it my time or your time for noise?” I said it with a smile on my face—no anger, just an air of logic that allowed them to take hold of their own self-control. I have many ordinary classroom experiences that became extraordinary simply because I had figured out whose problems belonged to whom and whose responsibility it was to fix the issues when they arose. By having a very general set of logical rules for all of us to abide by in the classroom, management or need for it became minimal. And, best of all, no more yelling to get what I wanted. I only needed to ask if we were all adhering to the decisions we had made about our rules. The rest of the issues truly took care of themselves. As my experience and wisdom grew over time, I became even more aware of what I needed to control and what I could let go. Parents were absolutely stunned that their kids behaved as well as they did in my classroom. All I could say is, “We have a very democratic method of class behavior that we use in the classroom, and it makes sense to all of us.” The secret was shared control, and it is a game changer.